A Good Rule for Online Conversations - Create! Teach! Inspire! I confess: I indulge in gossip occasionally. Never say anything ABOUT someone that you wouldn’t say TO them. It’s a pretty good policy to live by. Remembering it has kept me out of trouble more times than I can count. Don’t say (or write) anything to someone online that you wouldn’t say in person. 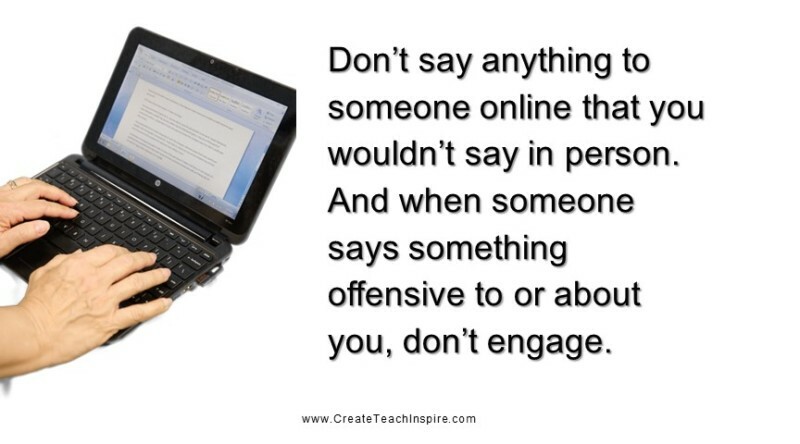 And when someone says something offensive to or about you, don’t engage. It’s just good manners and common sense. I like to think my friends—both the ones I know in real life and the ones I know only online—are civil people who live by this rule. But there are a few who don’t. And outside of my first-degree circle are plenty of people who don’t seem to know the difference between discuss and attack. Even though I recognize that the social media universe is probably not the best or most productive place to discuss political and social issues, I still do it on my personal Facebook page—and sometimes I engage when I probably shouldn’t. I’ve had some interesting conversations on a range of topics. While I’ve not had any major epiphanies or position changes, I have often been driven to do additional research to either defend my position or to challenge another. Learning is always good. I doubt that I’ve changed anyone else’s mind, either. In fact, when you read the posts on my Facebook page, one of the most common phrases you’ll see is: “We’re going to have to agree to disagree on this.” But before I get to that point with someone, we usually have a great exchange of ideas and information. What I don’t understand is why people feel compelled to spew hateful things online either to their friends or to people they don’t know. I don’t believe most of them would ever say such ugly things in person. Over the years, I’ve only unfriended two people on Facebook. One was a casual friend who called me a bigot for opposing Barack Obama (my support for black conservatives didn’t matter to her). The other was a professional colleague who insulted my friends in discussions on several occasions. I don’t believe either of these people would have been so rude in a face-to-face situation. When I share something political on Facebook, I usually share it as “public,” so I often get comments from people I don’t know. Mostly they’re positive, but I’ve had friends of friends leave insulting comments on things I have posted. 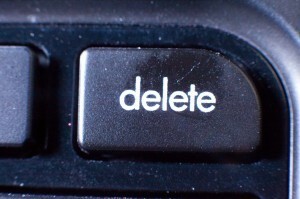 I remove those comments–and I tell them why: You don’t get to be rude on my page. It’s my page, and I get to choose what’s on it. I’m not the government, so this isn’t a free speech issue. You can disagree with me, but you have to do it politely when you’re on my page. I apply the same rule in my home. Use a lot of profanity or say hateful, hurtful things and you’re going to be asked to leave–or at least you’ll never be invited back. Don’t say anything to someone online that you wouldn’t say in person. And when someone says something offensive to or about you, don’t engage. What are your thoughts? Share them below—but with courtesy and respect, please.